North Dakota's recently completed Langdon Wind Energy Center is a good example of how a regional power player such as Otter Tail Power Company can join forces with a large utility like FPL Energy - with extensive wind power experience - and produce a successful alternative energy project. The 159 megawatt (MW) Langdon Wind Energy Center is currently the largest-and most recent-wind power project in North Dakota, but there's definitely more wind power on the way for this very wind-rich state. At the recent dedication of the Langdon project, North Dakota Governor John Hoeven noted that only a few years back, there was less than one megawatt of power produced from wind in the entire state. "Today, we have built, or have in planning, nearly 1,800 MW of wind energy to serve North Dakota and the region," said Hoeven. North Dakota has long been identified by the Department of Energy and its research laboratories as having the greatest wind energy resource and potential for wind generation development in the U.S. Measured by annual energy potential in the billions of kilowatt hours, it is even ahead of wind-blessed Texas. Some experts have gone so far as to call North Dakota the Saudi Arabia of wind power. Added to the resource side of the equation, the state also has few environmental restraints regarding land availability. The major challenge North Dakota seems to face is incorporating the power generated from new wind power facilities onto the existing transmission grid, and expanding that grid. But that's a challenge shared by many other states. So far, North Dakota has been quite successful at accommodating the energy load, with upgrades to the existing infrastructure and some additions. On top of the high quality wind resources, the state also offers favorable tax incentives, a supportive regulatory process, and landowners who, so far, have also been supportive. Governor Hoeven has set a goal of having 10 percent of North Dakota's energy produced from renewable sources by 2015, and has set up the Empower North Dakota Commission to move along the state's goals for renewable energy. Construction crews on the Langdon wind project had their work cut out for them, weather-wise, working in northern North Dakota in the middle of winter. Despite wind chills that made it a challenge to be able to work every day, construction workers persevered and the project was finished and operational in early January. What this all means is that the number of wind power projects in North Dakota has been increasing-and that there is very much more to come. The state's current wind champion-Langdon Wind Energy Center-is a venture between energy giant FPL Energy, LLC, a subsidiary of the FPL Group, and regional power company Otter Tail Power Company. FPL owns 118.5 MW of the wind center's output and Otter Tail Power Company owns 40.5 MW. Minnesota. It owns 27 of the 106 GE 1.5 MW wind turbines, located on the site. FPL Energy owns the balance and operates the entire wind center. FPL Energy is truly a wind power giant-as of mid-2008, it had some 56 wind facilities in operation in 16 states and is the largest, single producer of wind energy in the United States. And FPL Energy is also familiar with North Dakota. It operates four other wind projects in North Dakota with a capacity to produce more than 150 MW of electricity. It operates the 31 MW North Dakota Wind II-the state's second largest wind farm. Otter Tail Power Company buys the power produced at North Dakota Wind II on a long-term contract, so FPL's relationship with Otter Tail Power Company was already in place before the Langdon project. The Langdon project had an interesting beginning. A community group from Cavalier County-supported by the county's economic development office-actually approached FPL Energy about building a wind farm. Anxious to see additional business in the area, the group went ahead on its own and installed an anemometer, and took the very positive wind results to the Florida-based energy company. "People were very interested in moving forward with a wind power project for Langdon," explains Al Koeckeritz, manager of project development for Otter Tail Power Company. FPL came on board with the idea, and started acquiring land rights. Otter Tail Power Company joined the venture shortly after. "As things came together for the project, we looked at the ability to deliver power from the site, and it fit well with the service territory for our company. It also fit well with its capacity factor and the economics," says Koeckeritz. "We had been looking for a rate-base type of wind power project that we could be part of, and had been working in that direction to find something that fit our niche. The Langdon project fit well with the things we were trying to get done," he adds. The business model of being a part owner of the Langdon project, vs. buying power from the project, worked for the company from the start. "The economics made it viable for us. In this case, it's actually cheaper for us to own rather than enter into other power purchase power agreements that were available at the time. So we looked at the Langdon project as being a benefit to the company and our customers, and providing power at the least cost to our customers." 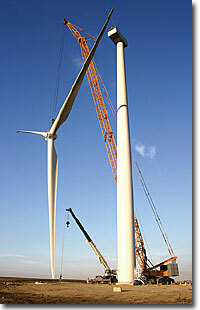 For companies such as FPL, which has completed dozens of wind power projects, Langdon was one more large project. But for a utility such as Otter Tail Power Company, they've worked to ramp up their knowledge-and skills base-in wind power. Langdon marks the utility's first large wind power project that includes partial ownership. "We've learned a lot about wind power from what we've done in the past, and we're still learning as we go," says Koeckeritz, noting there is enthusiasm within the utility for adopting a new-and alternative-way of generating power. Their first wind power purchase agreement was in 2003, with FPL. "We learned a lot going through that process, getting an understanding of the interconnection piece and the net capacity factor and all the details that apply to wind power vs. baseload power generation." Wind power projects bring their own specific challenges, he notes, such as meeting FAA requirements, avian studies and addressing any environmental concerns. "We're not wind power veterans, but we have more knowledge now than we did two years ago, and I expect we'll continue to learn and put additional efforts into wind energy facilities as we move ahead," he adds. "So far, we've chosen to work with developers that have projects." Koeckeritz agrees there is a good degree of comfort in having a wind power veteran such as FPL as a partner in a project. "They are very big in wind, and they bring a lot of value to a project, with experience in vendor relations, in getting a project built, and in meeting timelines." FPL did the groundwork in communicating with local residents and landowners with the Langdon project. But the fact that the company had already been approached by a local group to build a wind farm meant that there was already significant local support. The proximity of the project, and the interconnection line to the grid, was helpful, says Koeckeritz. "A benefit with the site at Langdon is that the line from the wind substation to the interconnection on the grid was reasonably short. So everyone who gave an easement for the line could look right down the road and see a direct benefit, with the wind facility being right there." Other projects that require significantly longer interconnection lines could face challenges, Koeckeritz notes. "The further you get from the wind facility, the less likely some landowners are to see a project's direct benefits, which can lead to not-in-my-back-yard objections to a transmission line." In terms of environmental issues, the Langdon project site is open, flat terrain-so there were no wetlands or other similar issues to deal with. Some turbines were re-sited as the project moved ahead, but this was minor in nature. There were some construction challenges. 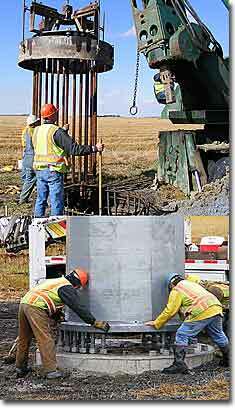 Construction crews had their work cut out for them, weather-wise, working in northern North Dakota in the middle of winter. "The Langdon site is almost at the Canadian border-it's a cold site, and the wind chills in December made it a challenge to be able to work every day." The cold weather broke late in December, however. "We were able to get the project finished up and operational in early January," says Koeckeritz. "We were pretty happy with how it all turned out." He notes that the timeframe from the start of the company's involvement with Langdon Wind to its completion was actually quite short. "We built this wind operation, and had it operational, in 15 months. That's a pretty short period of time to get something like this done." The end result has been successful, thanks to a robust wind resource on the site. It has a 44 percent net capacity factor. "We're excited that the capacity factor is as high as it is," says Koeckeritz. "Generally anything that is close to 40 percent is considered a good wind resource, and in some states, 30 percent might be considered good. It's nice to have that sweet spot at Langdon that produces so well." It's such a sweet spot that FPL will be adding another 27 wind turbines to the project by the end of this year. In an unrelated but interesting side note, turbines are not the only shapes on the horizon in this area. The center of the wind farm is located just outside of Nekoma, North Dakota, near the pyramid-like Stanley R. Mickelson Safeguard Complex, an anti-ballistic missile (ABM) site that was built and abandoned in the 1970s. The complex was the United States' first operational ABM defense system, and was deployed during the 1970s to defend the offensive Minuteman missiles based at Grand Forks Air Force Base, in the event of a nuclear missile attack by the Soviet Union or China. In terms of financial support, the Langdon project received some assistance from the state, including a reduction in property taxes, in addition to the federal production tax credit. Generally, North Dakota has been very pro-wind power in recent years. The state is actually a big power generator, period. With extensive coal-powered facilities, it is the sixth largest energy producing and exporting state in the U.S.
About 70 percent of Otter Tail Power's power currently comes from coal-powered plants. But going forward-and with the Langdon project behind them-wind is likely to play a bigger role in power generation for Otter Tail Power, and other utilities in North Dakota and Minnesota. "We are going to continue to focus on opportunities to invest in wind power and on the opportunity to own," notes Koeckeritz. "We'll evaluate things as we go ahead, but given the current economics of ownership, the best fit for us at this point is to look for further opportunities to own." He adds that the economics of wind power projects can change, however, and wind power purchase agreements might look better at some point. Regardless, the future for further wind power in the region looks bright. "In terms of an overall wind resource, we are in a great spot for a utility. We've got tremendous potential. We're in a much better position than some other utilities-we have renewable energy from wind right out our back door here." Koeckeritz notes there is talk of the federal government instituting some kind of national Renewable Portfolio Standard, which would help spur further development of wind power. "If that happens, that would be a big benefit for us." On the vendor side, he says that Otter Tail Power is looking to develop more long-term relationships with turbine manufacturers, so they have supply when projects move ahead. With the Langdon project, they purchased their 1.5 MW turbines directly from GE. "We'll go in the direction that we need to go-if we became aware of a project, and it needed to get done quickly, we'd pull out all the stops to find the turbines."